In 1937, a fairly new employee of the Denver Mint felt pressure to get more nickels out, so he attempted to hastily repair a Buffalo Nickel reverse die marred by "clashing". (Clash mark damage occurs when the upper and lower dies accidentally come together in the striking action without a coin blank in between). Now back to our story... this employee attempted to grind away the marks with an emery stick. In the rush, he also erased a large portion of the bison's foreleg. Production was resumed with the "repaired" die, striking a small quantity of "3-legged" nickels that got away from the Mint before the error was detected. From that time onward, the 1937-D 3-leg nickel has achieved notoriety among United States coin collectors. A long record of very sharp price increases solidifies its status as one of the most legendary of all coins. With the good comes the bad. Over the years, dishonest people have capitalized on the fame of the 3-legged variety by carefully removing a portion of the leg from ordinary 1937-D nickels and passing them off as the rarity. As is always the case when buying valuable U.S. coins, be sure the seller is of good reputation, and/or has been certified by PCGS, NGC, ICG, or ANACS. The 1937-D Buffalo Nickel with three legs is one of the most famous coins in United States numismatics, and has a price increase record to prove it. The blue line above tracks the percent gain in value of the coin since the year 2000, in G-4 condition. The red line is the performance over the exact same time period of our Rare Coin Values Index, which charts the composite percent change of a cross-sectional group of 87 rare US coins. 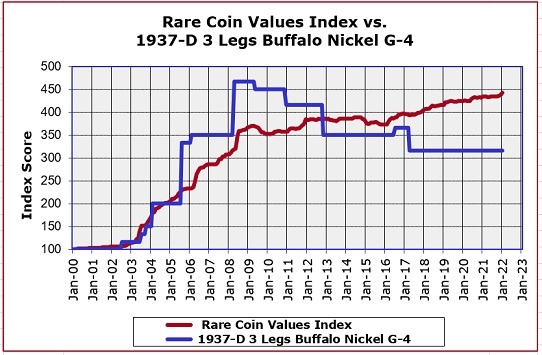 The 1937-D 3 Legged Buffalo Nickel is one of the 87 coins in the Index, so as you can see, it rates well above the average of the group. The goal of the Index is to give collectors an idea how well the US rare coin market is doin, and is updated monthly.